Colorado Part 3. What do we Say to the God of the Mountains? Not Today. We did not pay heed to your messenger warning us, no, challenging us, that we would die out at 11,000ft! We met at your gate upon Cinnamon Pass and we admit that we rode clumsily and slow – rocking, swerving, and wheezing like an asthmatic. We confess that we were scared and even thought about turning back around, but as I pushed against the 4WD stick and Rob against the edge we knew that you weren’t going to let us. Fine! I’ll run in and out, latching our armor (locking hubs) and setting the battlefield (moving rocks around so we don’t bottom out). And Rob will shine his sword (clean the 4WD boot) and steer our stallion (Bumi). Even when you sent your soldiers (Jeeps) to jeer at us, they instead fell for us and us them like Stockholm. 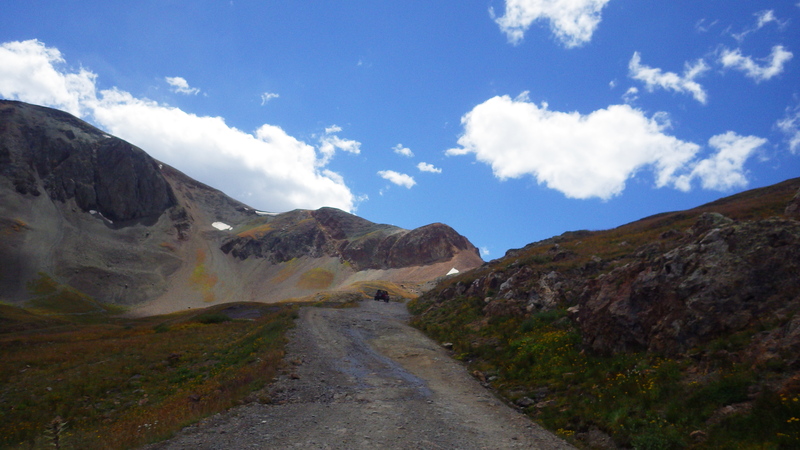 Then, when we summited at 12,620ft you laid one more trap for us at Ophir Pass. “Ophir Crying Out Loud!” Oh, we cried – cries of victory! Is going to give me a heart attack. This is by far the most intense driving I’ve ever done in my life. Though to be honest I haven’t been driving long….but that’s irrelevant. 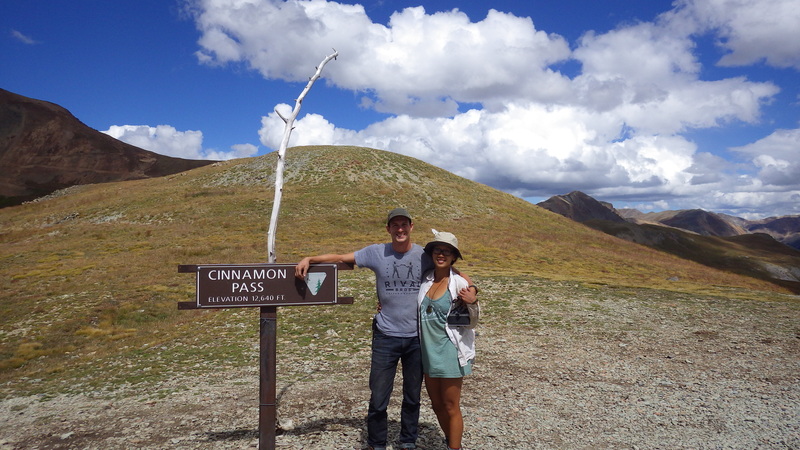 This portion of the blog will be covering the cinnamon pass and ophir pass sections of the trail. 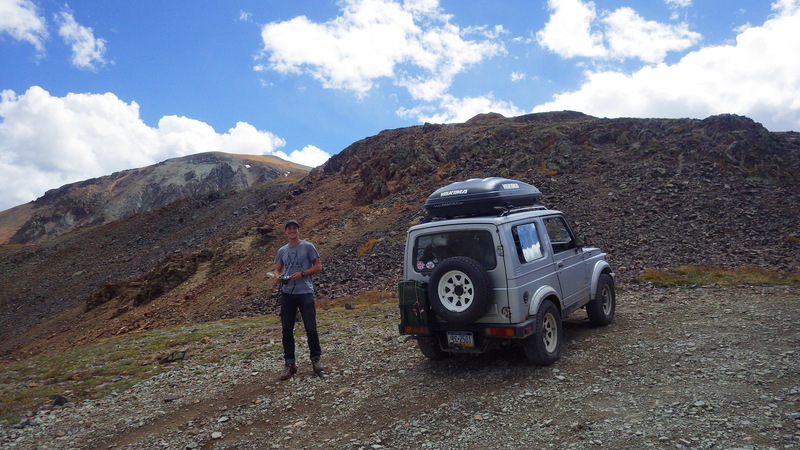 We decided it best to bypass the California Gulch portion considering it was a higher altitude and our rig BARELY made it to the top of cinnamon pass. Actually it didn’t at first, Bumi died at about 12000 feet up. The little engine sucked in what little air it could, and then suffocated on the remains. On a steep incline. About 600 or so feet from the summit. I had to ride the clutch just to make it up and keep the right amount of oxygen in the engine…which is not the best idea in any normal situation unless you like burning through clutches. A breathtaking ride in every aspect of the word, but also stressful to a first timer (and probably anybody I think?) especially if you and heights are not usually the best of friends. The pass starts simply enough, on a dirt shelf road that gives you every view you could possibly ask for. We were pretty much the only vehicle on there that was not either a shiny jeep with massive tires or an ATV. Actually I lied, we did encounter a group of sport bikes that may have been fellow TAT riders, but they passed us without a word even with our cool “Trans America Trail” sticker displayed promptly on our back window. The trail gradually gets a bit more difficult and steeper, with some rock scramble at points. I had Chelsea running in and out of the Samurai to lock the hubs. We ended up just leaving them and the 4wd on after a period of this and continuing with it anyway once the road got too steep for us to drive up normally (plus….no air) This is probably the first time on the trip where I figured it possible for me to totally topple off a cliff an die and I pretty much just accepted that means to an end, which made it a little less stressful….I guess. There was a point where we had to climb a large boulder, there was a rut on one side that looked to be where other vehicles had passed but wouldn’t really work out for us and our fairly shallow ground clearance (for a 4×4) So instead we got stuck in the middle of the boulder at an awkward angle and watched two jeeps cruise on past with little to no effort on their part. Can’t say I wasn’t embarrassed but finally we got up that boulder and caught up with the jeeps, riding the tail end of the newly formed little group. 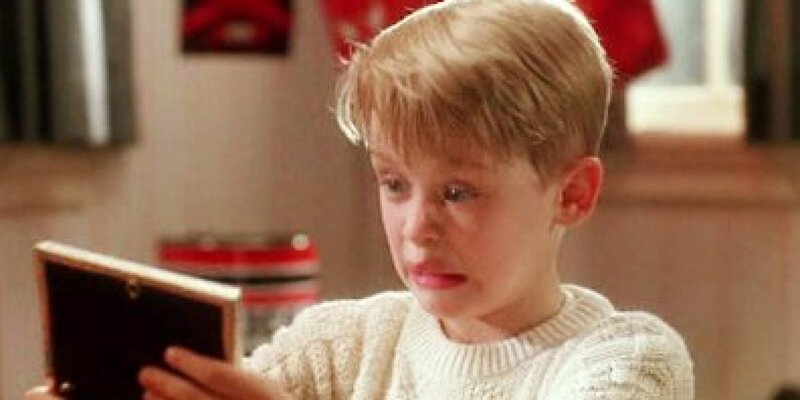 Which involved an entire family with two kids in a giant brand new 4 door wrangler, and another guy with his girlfriend that actually looked like he knew a thing or two about driving on mountains (I surely did not). He nodded at the samurai and said “first one I’ve ever seen up here” and told me he waited back a bit to make sure we made it up all right. He was pleased that we did, as were we. I guess soccer moms can definitely pick their kids up from a soccer game on top of a mountain at over 12000 feet if they just go buy a wrangler. Boulders or not. Our sort of caravan made it back down the other side of the mountain and into Animas Forks, which is a mining ghost town. A MINING GHOST TOWN. I peed behind an old shed that at one point in time was renowned for having “indoor plumbing” (which was really just an outhouse with a hallway to it) I was disappointed to find that the outhouse toilet was now literally just drawn on a piece of wood with a marker, but was able to find a semi-secret exit. 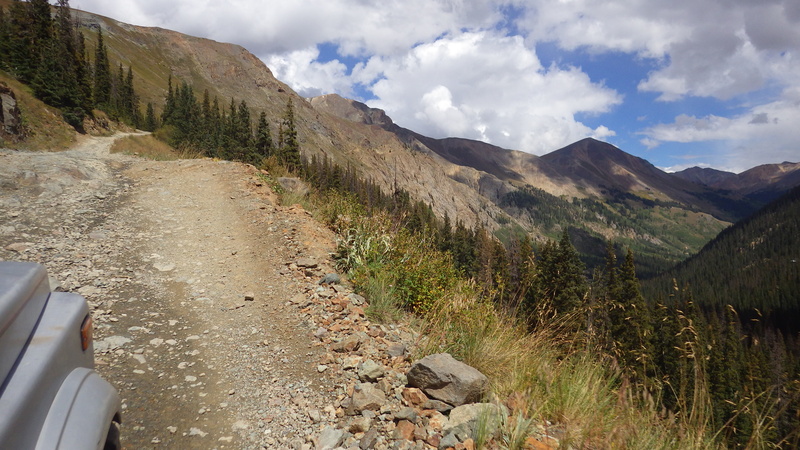 Animas forks was actually really rad though. I would love to camp in a ghost town. 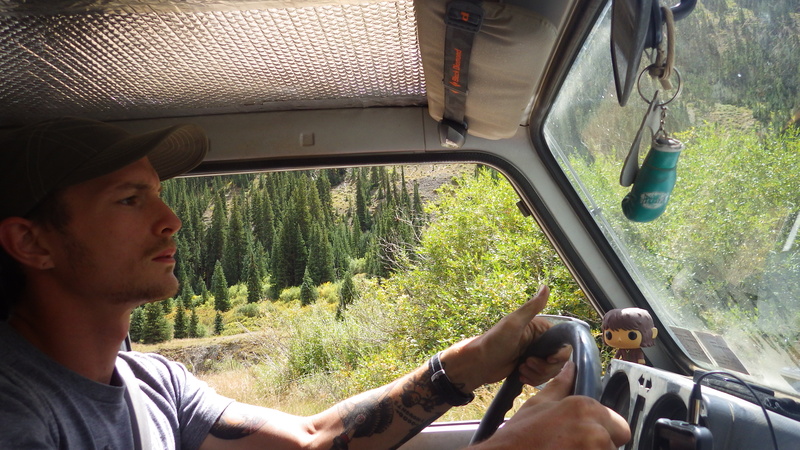 We asked a few volunteers that were working on the town the best way out that wouldn’t involve going over California gulch and its warning notes of “Twisters and corkscrews, good brakes a must” and its absurd altitude. 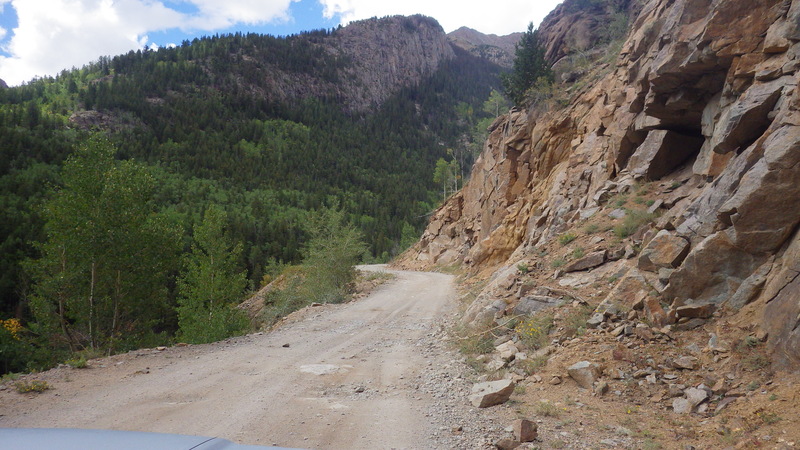 We found another dirt road that led to Silverton and then back onto the trail. 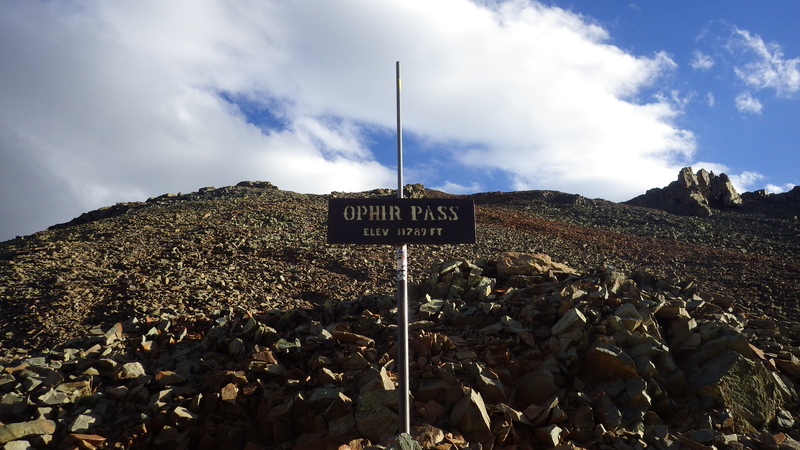 We met the trail again and reached Ophir pass. By now we were prepared for what was to come. Honestly the climb was not at all bad, and once you reach the summit, a mear 11,789 feet, You’re ready for a nice cruise back down again. WRONG. 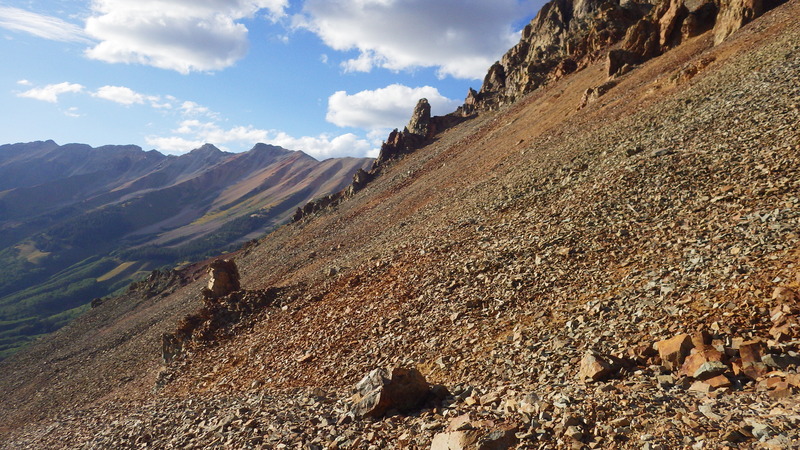 The whole way down is a mess of scree and a ledge dropping thousands of feet on one side while piling up to the top of the mountain on the other. Its really not so bad if you take your time and work through smartly. Still a punch to the face of any sort of relief from anxiety you might have had though. 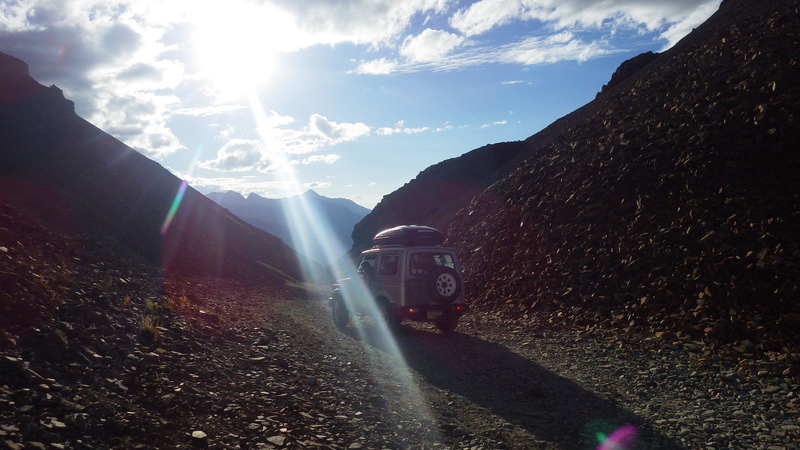 -Rob Mac, Suzuki Samurai Mountaineer.